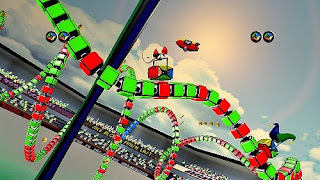 Rock A Block is a competitive racing game that has you following a roller coaster-style path of colored blocks. Each block is a certain color while you, also a block, have four different colors, one on each side (not counting the "arm" sides of the cube). Consider yourself a square wheel that just bounces. 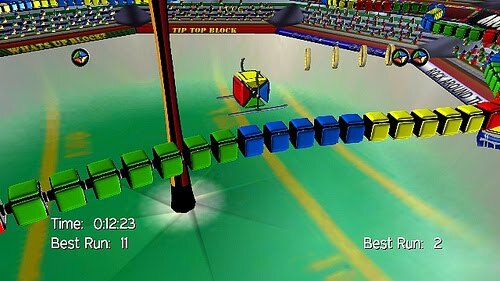 Anyway, the only way to move forward is to rotate your cube so that the part that touches the track is the same color as the track itself. It's a little weird to explain but one of those things that clicks pretty quickly once you start playing. Aside from this basic formula for movement, you collect coins to give you usable turbo boosts and can switch between the top and bottom of the track to either get more coins or cut off your opponent. If you remember Uniracers, you remember how simple a 2D racing game can look. Well, the developers at Don't Press X decided to make everything 3D, not only making it look good but also giving the blocks a bit of character. Each racer has a specific trait and, with that trait, a specific prop. For instance, the crazy opponent that constantly switches sides has a jester's cap, and the block you pick to make your opponents slower has feminine devil horns and a tail. In addition to this, the race is in a giant arena filled with bouncing block spectators and giant pun-filled or block-related banners. "Nice Blocks Finish Last", "Can't Stop The Block", "We Will Block You", etc. all line the stadium and provide a nice touch. The sound effects, though nothing spectacular, get the job done and provide a little help with your rotation timing. The controls consist of four whopping buttons for your block-bouncing pleasure. LB and RB rotate appropriately, A fires off your turbo, and B will switch you between the top and bottom parts of the track. I'm not entirely sure the LB/RB rotation method was the best way to go with a game that has you constantly switching sides or going different directions, but I am curious if a face-button method (A for Green, B for Red, etc.) would have been too easy. It does take some getting used to for the more difficult tracks later on, but it's entirely doable with enough practice. For a four quarter game, there's actually a lot here. You can race in three different championship cups, each one with three different tracks and opponents (nine events total per cup), or you can just do one race against whatever opponent on whatever track. With five different opponents, nine tracks, and nine different usable racers to unlock, there's a decent amount to do and unlock. I do think the championship cups felt a little too lengthy when you're racing on each track three times, but races don't last long so it's a minor gripe. On the downside, the two-player mode is nearly unplayable unless it's a close race all the way through. Reason being? It's NOT split-screen. If you're far ahead of someone, you might not even be able to see your racer or the track it's bouncing on, and this forces you to rotate randomly to figure out how to proceed. It's a somewhat ridiculous oversight and, even worse, a crying shame as the local competitive races could have extended the replay value of this game through the roof. With all that said about the multiplayer, the game is still fun for at least a day and could easily take away a few afternoons or draw you in for a couple long addictive nights of trying to unlock racers or beat difficult tracks in single player. It's just sad that the thing I was looking forward to most, the local competitive racing, is broken, and that keeps it at simply being alright rather than amazing. I do recommend trying it out as it's one of the more interesting ideas out there and deserves some attention, but don't expect to play it with anyone else without some frustration and disappointment. Rock A Block from Don't Press X is available on the XBox Live Marketplace for 80 MS Points. Beat each cup, played a dozen or so single races, and then tried out multiplayer about four times before getting tired of not being able to see what the hell was going on. Still laughing at the "Don't Press X" opening.